Single stack 9mm pistols are increasingly popular. Thin in profile and easy to conceal, they are some of the best choices for concealed carry, and in states that limit magazine capacity may be chosen over full sized pistols with reduced capacity magazines. But just what is a single stack 9mm, and what is the best single stack 9mm pistol? We are going to look at some technical details, and then look at some popular handguns, and leave you, the reader with the information you need to judge for yourself. What is a Single Stack? Why is a Single Stack 9mm Best for Concealed Carry? How to Choose a Single Stack 9mm? Single stack refers to how the ammo is loaded in the magazine of a semi auto pistol. A single stack magazine simply places one round above the other. This is opposed to a double stack magazine that staggers rounds in a column. The primary advantage to a single stack pistol is that it will be by design narrower, and thus more compact. Typically a single stack pistol runs no more than ten rounds in capacity, as much more would create an absurdly long grip or lead to a magazine sticking out far below the grip. As a general rule, you want a compact and lightweight handgun for concealed carry. After all, a bulky, full sized pistol is harder to conceal than a sleek, compact gun. Not only will a single stack 9mm have a narrower, easier to conceal profile, but won’t carry the added weight of nearly 20 rounds of ammo like a full sized, double stack gun. There are other considerations though that make a single stack 9mm best for concealed carry. There are lots of small handguns on the market, and they usually come in small calibers, or are revolvers with limited capacity compared to a semi auto pistol. Anything larger in caliber than 9mm starts getting bulkier and carrying fewer rounds, and anything smaller tends to be marginal to unsuitable for self defense. After all, why choose a .22 if you can choose a 9mm instead? Sure there are exceptions to this rule, but for most people in most circumstances, the 9mm single stack becomes the ideal combination of power, ammo capacity and concealability. What this combination of size and power has created is a market for single stack 9mm pistols designed specifically for concealed carry purposes. In fact, it is one of the hottest markets for handguns, and there are a number of great single stack 9mm pistols being sold today. Let’s take a look at some! A single stack 9mm then is a 9mm handgun designed around these single stack magazines. While there are some full sized single stack handguns, you almost only find this type of design in compact concealed carry pistols. You also will find single stack magazines fitted to double stack guns in states with strict magazine capacity limits, but this is beyond the scope of this article. 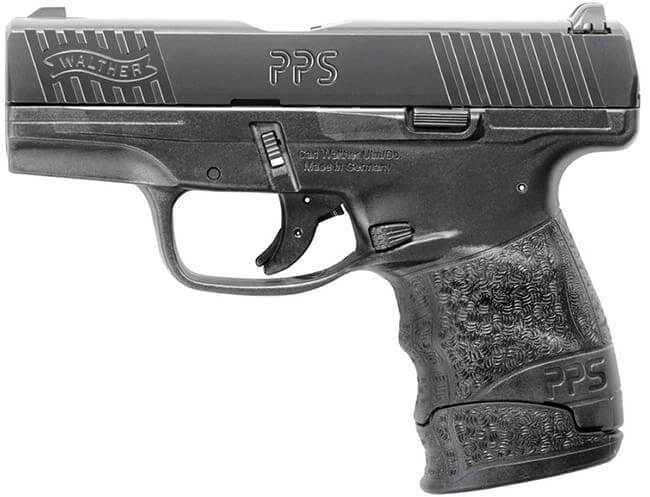 The Walter PPS M2 is Walther’s premier single stack 9mm pistol for concealed carry. Designed from the ground up to be an ultimate concealed carry pistol, it is created for the unique needs of concealed carriers. Designed for safety, it features a dedicated trigger safety, and a red cocking indicator which shows when the gun is cocked and loaded. The ergonomics are also incredibly impressive. The ergonomic and lightweight polymer frame is shaped to fit in a variety of hands, and aggressively textured to provide a solid grip even with wet hands. Polygon rifling ensures optimal accuracy, while the three dot sights are visible even in low light settings and enhance accuracy. Walther ships the PPS M2 with a six round and a seven round single stack magazine, which allows you to choose a longer or shorter mag for concealed carry comfort. Just an inch wide and about 5” tall, it is an incredible example of why a single stack 9mm is a great choice for concealed carry. The biggest downside to the Walther PPS M2 is the somewhat limited magazine capacity. Bersa’s first polymer frame pistol the Bersa BP9CC is a shining example of how to build one of the best single stack 9mm on the market. From the slide on down, the BP9CC is designed to be adaptable and easy to use. Unlike many manufacturers, Bersa goes ahead and uses common sights- the rear sight is Glock compatible, and the front sight is Sig style, ensuring that there are plenty of aftermarket options to customize the pistol to your liking. The single stack 9mm magazine holds eight rounds, and the gun itself is less than one inch wide. Just under five inches tall, the BP9CC has ambidextrous controls, a double action trigger, and a built in Picatinny rail for mounting a light or laser, or other accessories. Available in 9 different colors, including a striking turquoise/white two tone, the BP9CC is both attractive and functional. Offering enough ammo capacity to be more than useful, while still being both slim and short enough to easily conceal, it is a surprisingly affordable handgun for the number of advanced features packed into it. Choose it if you aren’t hung up over brand name, and prefer features, mag capacity and a very compact design. Glock is all but single handedly invented the 9mm revolution of the 1980’s that coined the term “wonder nine”. However, despite popularizing double stack 9mm pistols, Glock was oddly absent from the single stack 9mm market, even though it is a growing market. However, Glock Perfection eventually came around to the need to build a Glock quality single stack 9mm, and the Glock 43 was born. Quite literally a scaled down Glock pistol, the model 43 is a bit blockier and larger than some other single stack pistols, but not by a lot. It is noticeable, but should not matter at all in cases of concealed carry, and some folks will benefit from the slightly clunky lines of a Glock. Packed with standard Glock features like multiple active and passive safeties, easily changeable sights, rugged construction that passes military grade testing, and the ergonomics of a full sized Glock, this might be the best single stack 9mm pistol on the market. More problematic that Glock only manged to squeeze six rounds into their standard magazine. While this is a number that keeps getting repeated, it is one that probably shouldn’t. 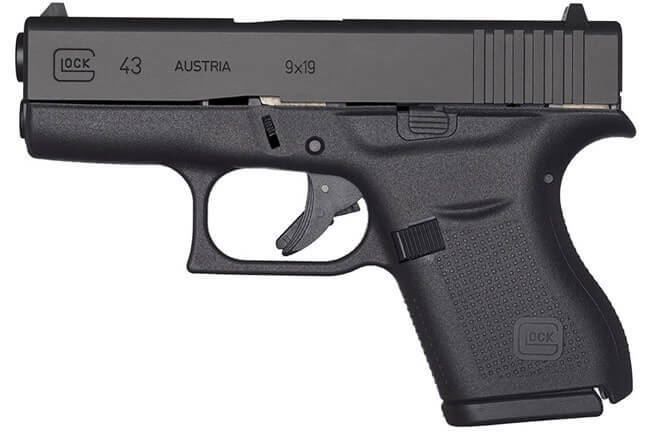 However, the Glock 43 makes up for that shortcoming by being well, a single stack 9mm Glock. Honestly, at some point single stack 9mm pistols start looking alike. The truth is, that if you want a polymer frame, single stack 9mm concealed carry pistol, the industry has quickly standardized on a similar form factor and even 3.1” or so barrel length that lead to a number of mostly similar pistols notable mainly for brand name or aesthetic design. That’s why it is refreshing to find a pistol that is both very familiar looking in form factor, but packs uncommon features among single stack 9mm pistols. Things like an available 8 round magazine, a manual thumb safety, and three dot sights really make this a refreshing pistol to examine. 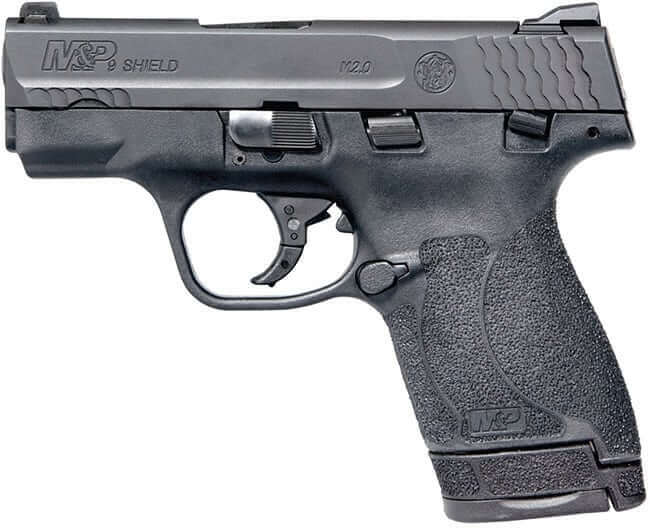 The M&P9 shield is a scaled down M&P, so like the Glock 43, it is immediately familiar to anyone using the full sized version. This makes it ideal for law enforcement who carry a Shield, or persons who like to switch between full sized and single stack 9mm Shields. A stainless steel slide is perfect for conceal carry due to the reduced likelihood of rusting. The target style sights, Smith and Wesson styling, durable Armornite finish, light 20.8 ounce weight, and slimline construction all come together to make an easy carrying, hard hitting single stack 9mm pistol. 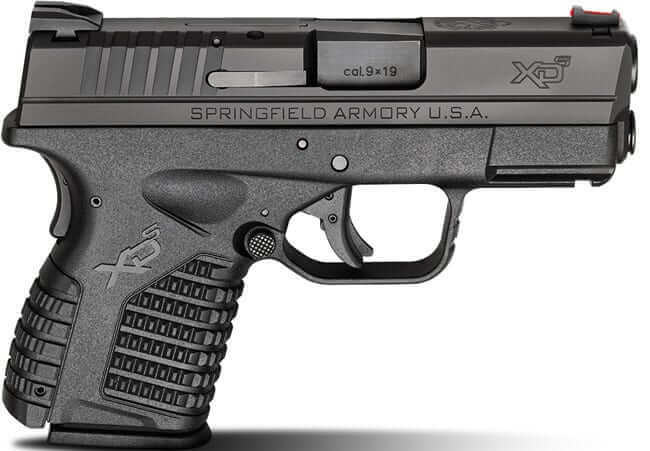 Another single stack 9mm that has an available 8 round magazine, the Springfield XDS 3.3 runs a slightly longer barrel than other single stack 9mm’s, and offers an outstanding fiber optic front sight. Similar in size competing models, the XDS 3.3 is slightly less than an inch thick and includes a recoil eating dual spring full length guide rod. The grip design on the XDS 3.3 is especially pleasant, as it allows a solid grip, regardless of weather or a sweaty hand. What this means is that the XDS 3.3 is probably the only single stack 9mm with such recoil busting technology built right in. While single stack 9mm’s are usually pretty easy to shoot, but when running hotter loads, it never hurts to have the dual recoil spring. Along with the 8 round and fiber optic sight, the XDS 3.3 is available in four different colored finishes. This is an oddly uncommon option in the world of single stack 9mm concealed carry guns, and helps make a gun more attractive to more buyers. The built in grip safety makes the XDS safer than other striker fired single stack 9mm’s with a Glock style trigger safety. This added peace of mind is critical for a compact single stack 9mm pistol, especially when carried deeply concealed. The Ruger LC9s Pro may be the most visually appealing single stack 9mm on the market. Taking design queues from the Ruger LCP, and other compact Ruger guns, the LC9s Pro has an aesthetic that also makes it ideal for concealed carry. Streamlined design, and rounded sights make for an easy carrying, and easy drawing gun that is snag through and glides over concealing clothing. The dovetailed, and driftable rear sight can be quickly adjusted for windage and the performance of your favorite carry load. One nice factory extra that doesn’t always come on a single stack 9mm is the finger rest that can be installed on the magazine, making it more comfortable to hold. 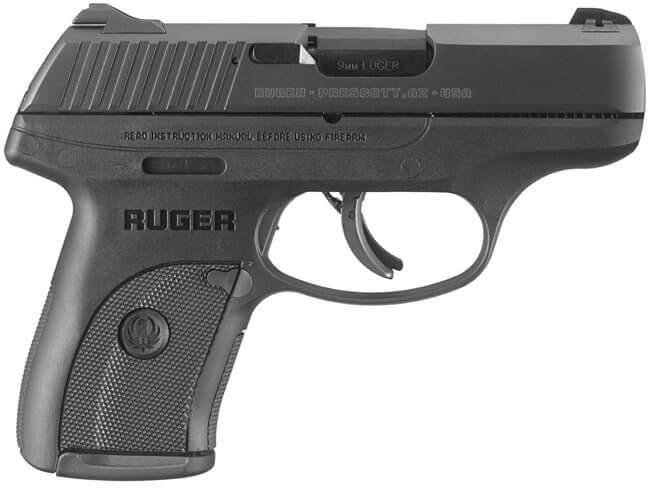 However, Ruger only ships a single 7 round mag with the LC9s Pro. 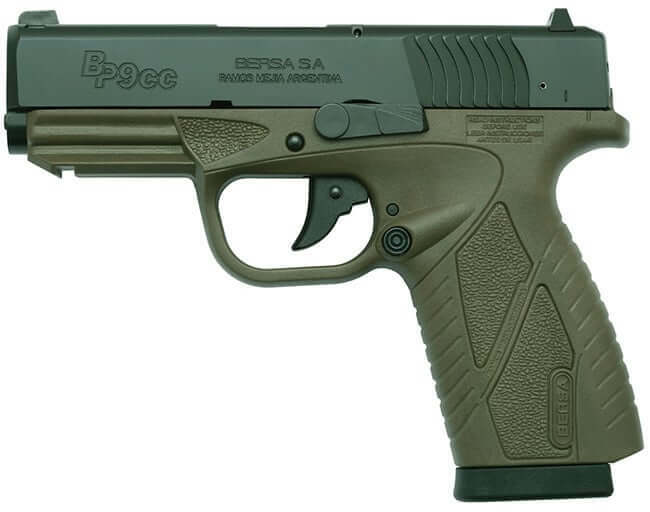 The Pro also differs from the standard LC9s by removing the manual and magazine safety. This doesn’t make it unsafe, but it does away with redundant mechanical devices that only make the gun more complex. The trigger safety still ensures a perfectly safe mode of carry at the same level of a Glock or similar gun. Ruger also sells the LC9s Pro in a bewildering away of colors, including pink camouflage, which are available through major distributors. One thing we can see is that there really isn’t a huge difference between various single stack 9mm’s. They all have basically identical length of barrels, and one could argue in a small pistol, the difference between regular and polygon rifling isn’t all that important. Instead, the most important things that differentiate between various single stack 9mm pistols is magazine capacity, overall aesthetics and type of sights. We can see some guns only ship with six round mags, while seven or eight round magazines are available on other models. One might argue mag capacity isn’t that important, but few people ever complained about having too many rounds in their magazines. Some guns have high quality sights, while others have basic sights. Only you can decide what kinds of sights on a single stack 9mm are right for you. Some guns will come in a single color, others will offer a few different colors, while Ruger seems to have a color combo for almost every taste in how their gun looks. Ultimately, choosing the best single stack 9mm really boils down to your budget and which gun feels best in your hand and has the sights you like the most. Unless you desperately need an extra round or two, don’t place too much thought on mag capacity unless that is the only real difference between choosing two models. There are a lot of single stack 9mm pistols on the market, and they have a lot in common, but are all different enough to make a difference to the consumer. Find the one you like best, and enjoy the protection a single stack 9mm can bring you!